In this article we will examine physical therapy and yoga for people with low back pain. We will look at who these treatments will work for. We will also look at who these treatments can’t work for. We will also look at what people can do to make physical therapy work and avoid unnecessary spinal surgery. Let’s start with physical therapy and its frequent companion therapy, chiropractic manipulation. Physical therapy is a major component of the orthopedist’s “conservative” approach to low back pain relief. The Caring Medical experience is that the results of PT are often disappointing. Disappointing may not be the right word, perhaps dangerous would be better. What makes physical therapy and its frequent companion treatment chiropractic manipulation dangerous is that they were given to patients who could not benefit. But it wasn’t the therapy that was dangerous, it was the failure to achieve pain relief from it. When these patients went back to the orthopedist and reported lack of success in physical therapy, chiropractic, massage, yoga, etc., the failure of these treatments were used as justification to send that patient to possible unnecessary spinal surgery. That is the danger of the failure of these treatments. Who are these patients at risk for unnecessary surgery? These are patients who suffer from pain caused by spinal instability from weakened and damaged spinal ligaments. For physical therapy, and as we will see later in this article, yoga and pilates, to work, a person needs strong spinal ligaments. Strong spinal ligaments provide resistance the spine and core muscles need to strengthen the core, provide stability, and make physical therapy more successful. Who would PT and chiropractic manipulation not work for? Let’s look at some research. Early physical therapy resulted in statistically significant improvement in disability relative to usual care but the magnitude of the difference was modest and did not achieve the minimum difference considered clinically important at the individual patient level. (It didn’t help that much). There was no difference between groups in the Oswestry Disability Index score at 1-year follow-up. (At one year both patient groups, those who had PT and those who did not reported the same results). Results did favor early physical therapy at 3-month follow-up for outcomes of patient-reported success and overall health and fear-avoidance beliefs for work. (That they were getting treatment helped get people back to work, but it may not have been the treatment) as there were no improvements in scores for pain intensity or the Fear‐Avoidance Belief Questionnaire (a scoring system for people fearful of moving) for physical activity outcome at any time point. Because there were no changes in scoring, the patients may have gained improvement through the placebo effect. The researchers were not trying to say physical therapy did not work better than educational guidelines, what they were trying to show was the physical therapy did provide benefits for many patients. Patients who were at risk for physical therapy failure should be identified sooner. In the screening process of the study, patients with pain radiating into the knee area and clinical findings suggesting nerve root compression (suggesting lumbar radiculopathy, sciatica) were excluded, as well as patients who had a previous spinal surgery. And this is what we find at Caring Medical when taking a patient history. The patients will tell us their story of treatment, success, remission, new pain, sometimes worse pain, back to therapy or the chiropractor. They will repeat the cycle until such time as the cycle is broken by pain management medication therapy or a recommendation to surgery. What they generally do not tell us is that they went to a doctor and that doctor did an examination on their back and hip area looking for instability caused by spinal ligaments and the accompanying muscle weakness, spasm, and low back pain. There are two sets of muscles in the body: mobility muscles and postural stabilization muscles. Mobility muscles are important primarily for their ability to contract and create, manage and move large joint. The triceps and bicep muscles that move the arm and the tensor fascia lata, psoas and quadriceps muscles that move the leg belong to this first group. The postural stabilization muscles are deeper muscles that contract as the mobility muscles move the joint and usually have proximal (center or core) attachments that remain fixed, either on the spine posteriorly (behind) or on the sternum and ribs anteriorly (in the front). They are the anchor when the distal or furthest attachments to the mobility muscles are moved. These stabilizer muscles are often referred to as “core” muscles since they attach to the axial skeleton and pelvis, which are considered the foundation of the human body. Thus, the two sets of muscles work together, with the stabilizing muscles contracting and stabilizing a person’s core as the mobility muscles move one or more peripheral joints. For example, when the tensor fascia lata and psoas muscles contract to move the lower leg, the contracts to hold the pelvis in place so it cannot move, thus stabilizing it so the two mobility muscles can move the leg. The primary role of the core muscle systems in the lumbar spine and pelvis is to provide segmental control and dynamic stability to the spinal column it cannot be done without strong ligaments. The lumbar region is well endowed with the core muscles, which play a role in the stability of the spine. These muscles—the abdominal muscles, the psoas major, and the erector spinae—are all actively involved in maintaining the functional stability of the lumbar spine in both upright and sitting postures. Their muscle action is especially crucial during the very high loading that the lumbar spine typically undergoes. Without these muscle forces, such large loads would cause disruptions in the lumbar vertebral column and likely result in spinal instability and severe pain. The posterior core muscle group is further divided into superficial, intermediate, and deep subgroups according to their muscle length. the deep muscles are the shortest and connect adjacent spinous processes. These latter muscles move the trunk and back. 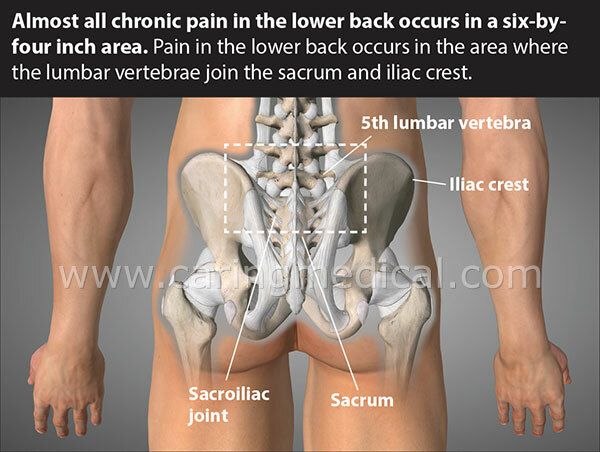 Except for the lower back, muscles do little to stabilize the joints since their job is to move the joints. Large muscles are necessary in the lower back due to the enormous forces that are transmitted to support the body’s weight; thus, the core musculature is an important part of maintaining spinal stability, but is not the most important part—strong ligaments are. Ligament laxity is what causes spinal instability throughout the spine and neck, and Prolotherapy treatment for back pain (see video) is the primary treatment for restoring spinal stability, with core strengthening exercise playing a secondary role. An injury to one section of the spine affects other sections but the action of the erector spinae muscles is also a contributing factor. The vertebral joints (hinges) in the spine are very close together and when one is loose, it causes increased forces on the next vertebral level, as well as a contraction of the erector spinae muscle, which then pulls on the vulnerable segment, causing it to become unstable as well. To be curative, the treatment for chronic diffuse spinal pain must be a comprehensive regimen of tightening all the “screws” on all the loose “hinges”. 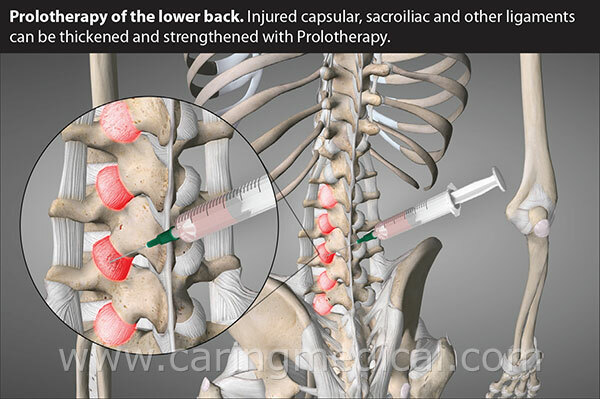 This is why Prolotherapy to the spine can involve multiple areas and many injections. If you do not comprehensively treat all the loose ligaments with Prolotherapy, the pain will likely recur. Some patients with lower back pain have seen great results with yoga. Some patients have seen poor, none, or worse, results that caused greater injury to the low back. Why do some get benefits and others didn’t? How do some hurt themselves worse? The answer is ligaments. Let’s first paint a picture by way of a comparison between yoga and physical therapy and the ligament problem. If ligament damage and weakness are the problem, a patient trying yoga and physical therapy will find in most cases, neither will help. If the patient’s ligaments are still strong enough and can provide the spinal and core muscles resistance, the spine will be stable enough for yoga and physical therapy to work and provide great relief. Research that was published in the July 2017 edition of the Annals of internal medicine (2) helps us shed some light on realistic expectations for Yaga and Physical Therapy. “The yoga and physical therapy groups showed almost the same amount of improvement in pain and activity limitation over time.” (As I stated above, Yoga and physical therapy should work the same for the same patient). “The improvements in pain and activity limitation in the yoga and physical therapy groups were also found at 1 year and were similar to each other.” (Again, Yoga and physical therapy should work the same for the same patient). “Yoga did not perform better than education in terms of improvement in pain and activity limitation at 3 months.” (Yoga did not work better than simply educating the patient on how to handle their low back pain, similar findings were noted in the above study centered on physical therapy from the University of Utah. Again, PT and yoga should be just as effective or ineffective in the same patient. 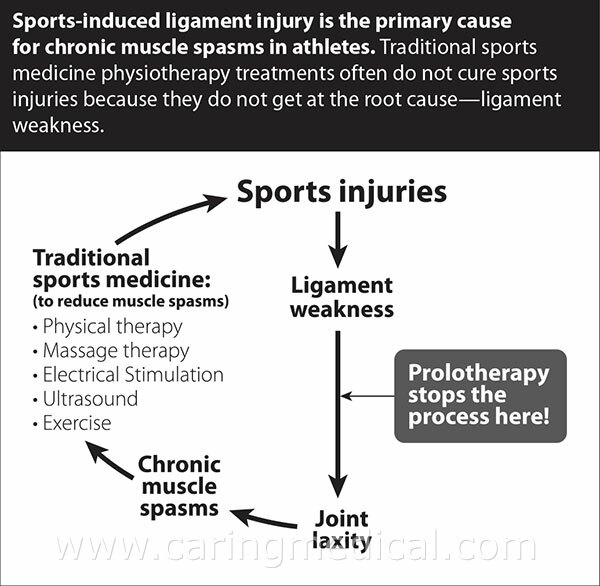 It is all about the ligaments). “However, participants in both the yoga and physical therapy groups were less likely to use pain medications at 3 months compared with the education group.” (As noted in the University of Utah, the ptients were getting treatment, treatment in the short-term no matter the treatment will likely show improvements in patients who are hoping that the treatments will work. The placebo effect if you will). “Other measurements (satisfaction and quality of life) were similar between the physical therapy and yoga groups. (Again, yoga and physical therapy should work the same for the same patient). The portions of the above in quotations comes from the Annals of Internal Medicine, patient information recap of the study. “There is low- to moderate-certainty evidence that yoga compared to non-exercise controls results in small to moderate improvements in back-related function at three and six months.” (Again, yoga can be best effective when the spinal ligaments are strong. If spinal instability is the problem, yoga will not be successful for very many patients). “Yoga may also be slightly more effective for pain at three and six months, however the effect size did not meet predefined levels of minimum clinical importance.” (Confirming again if spinal instability is the problem, yoga will not be successful for very many patients. “It is uncertain whether there is any difference between yoga and other exercise for back-related function or pain, or whether yoga added to exercise is more effective than exercise alone.” (Again, yoga and physical therapy should work the same for the same patient). “Yoga is associated with more adverse events than non-exercise controls, but may have the same risk of adverse events as other back-focused exercise.” (See note below on people overdoing it on weak ligaments). Pilates is an exercise program that concentrates on the deep stabilizer muscles of the core. Pilates, like physical therapy, like core stabilizing exercises, can only work when the ligaments of the spine can support the exercise activity and provide resistance so the muscles strengthen. It is very rare to see research that says one form of exercise works and another does not. They either all work or they all don’t work. Studies supporting one form of exercise over another support this idea. “On the basis of the present study it can be concluded that lumbar stabilization exercise, dynamic strengthening exercise and Pilates are beneficial in the treatment of chronic nonspecific low back pain for reduction of pain, improvement in functional ability, increase range of motion and improve core strength. They all worked. One a little better than the others in this one group. In approximately 90% of patients, low back pain is mechanical in nature, typically originating from overuse, straining, lifting, or bending that results in ligament sprains, muscle pulls, or disk herniation. 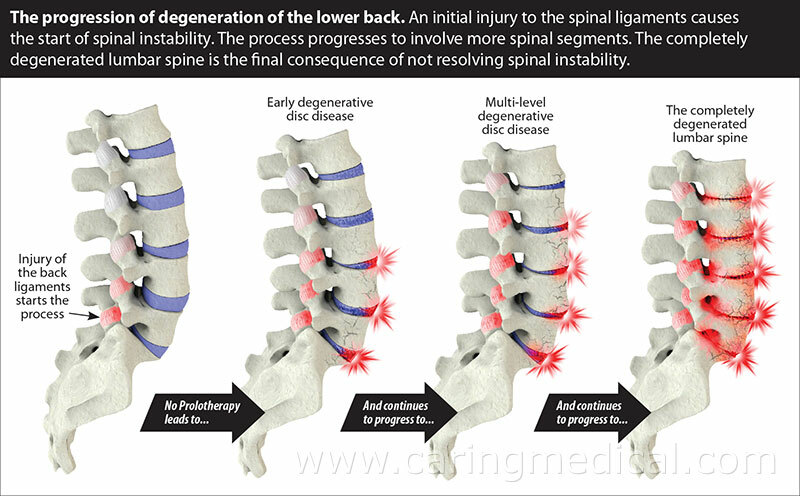 The popular understanding of back pain is disc herniation as a frequent cause, but to a much greater extent, ligament injury forms the underlying basis. Ligaments hold the disc in place, and with ligament weakness, the disc is more likely to herniate. The entire content of this article is nicely summed up in these few words. “insufficient stability to permit effective muscle recruiting strategies.” Without the ligaments, physical therapy cannot work. Experimental studies have found Prolotherapy effective in stimulating the production of collagen fibers, thus strengthening ligaments. We looked at 145 patients, who had been in pain an average of four years and ten months, and were treated quarterly with dextrose Prolotherapy. This included a subset of 55 patients who were told by their medical doctor(s) that there were no other treatment options for their pain and a subset of 26 patients who were told by their doctor(s) that surgery was their only option. Patients were contacted an average of 12 months following their last Prolotherapy session and asked questions regarding their levels of pain, physical and psychological symptoms and activities of daily living, before and after their last Prolotherapy treatment. These patients were treated every three months on average. 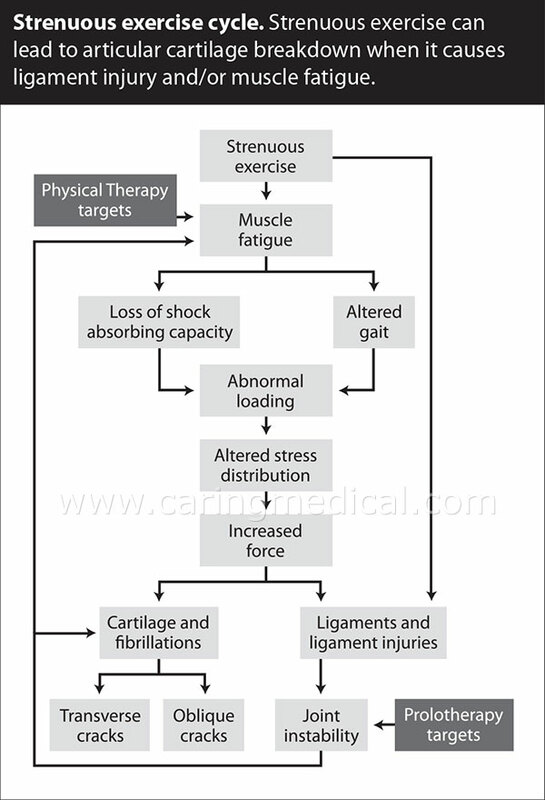 In summary, when physical therapy does not work, then the person should consider Prolotherapy. 3 Wieland LS, Skoetz N, Pilkington K, Vempati R, D’Adamo CR, Berman BM. Yoga treatment for chronic non‐specific low back pain. The Cochrane Library. 2017 Jan 12. 7. Hauser RA, Hauser MA. Dextrose Prolotherapy for unresolved low back pain: a retrospective case series study. Journal of Prolotherapy. 2009;1:145-155.